you can try this out http://midwaycareers.com/2014/11/20/ Today – November 14, 2015 – marks the 50th anniversary of the Battle of Ia Drang, November 14-18, 1965. 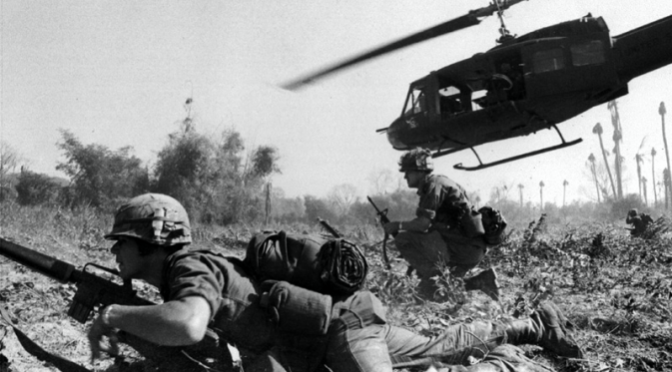 This was the first major action of the Vietnam War which saw American forces fighting the People’s Army of Vietnam (PAVN), also known as the North Vietnamese Army (NVA) rather than the Viet Cong guerillas. Ia Drang was the first time the United States Army‘s new air assault tactics as implemented in the 1st Cavalry Division (Airmobile) were really put to the test, and tested they were. The fighting during the first three days of the battle ultimately produced three Medal of Honor recipients and three recipients of the Distinguished Service Cross. Two of the Medal of Honor recipients were helicopter pilots who maintained the critical airborne lifeline between the soldiers fighting on the ground and their bases to the rear. Their names were Major Bruce P. Crandall and Captain Ed W. Freeman. Bruce Perry Crandall was born in Olympia, Washington on February 17, 1933. He was attending the University of Washington at Seattle when he was drafted into the United States Army in 1953. In 1954, he completed Engineer Officer Candidates School and was assigned to Army Aviation. At the time of the Battle of Ia Drang, Crandall was a Major and commanded Company A of the 229th Assault Helicopter Battalion. Ed W. Freeman was born on November 10, 1927 in Neely, Mississippi. He left high school as a 17-year-old to enlist in the United States Navy and served during World War II. After his discharge from the Navy, he completed high school and then enlisted in the United States Army in 1946. He fought as an infantryman during the Korean War, and also received a battlefield commission as a Second Lieutenant. He received the nickname “Too Tall” because at 6′ 4″, he was above the height restriction for an Army aviator. That restriction was lifted in 1955, and Freeman achieved his dream of becoming a pilot. At Ia Drang, Freeman was a Captain and Crandall’s second-in-command. The initial air assault into the Ia Drang valley at landing zone (LZ) “X-Ray” at 1048 hours on November 14, 1965 was unopposed. As the helicopters Crandall and Freeman led brought more and more of the 1st Battalion, 7th Cavalry into the LZ, the troops on the ground engaged in ever more intense combat and relied entirely on the helicopters to keep them supplied with ammunition and evacuate wounded troopers. The two fliers heroism took decades to recognize properly. 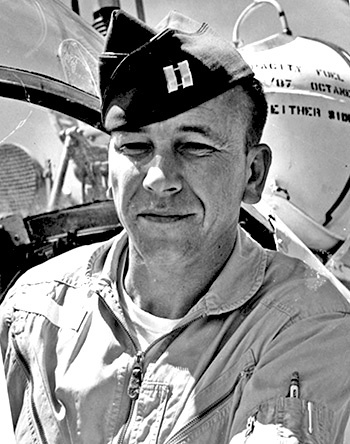 At the time, Crandall received the Distinguished Service Cross and Freeman just the Distinguished Flying Cross. On July 16, 2001, Ed Freeman received the Medal he so justly deserved. Crandall’s DSC was similarly upgraded on February 26, 2008. Here are their citations. Citation: For conspicuous gallantry and intrepidity at the risk of his life above and beyond the call of duty: Major Bruce P. Crandall distinguished himself by extraordinary heroism as a Flight Commander in the Republic of Vietnam, while serving with Company A, 229th Assault Helicopter Battalion, 1st Cavalry Division (Airmobile). On 14 November 1965, his flight of sixteen helicopters was lifting troops for a search and destroy mission from Plei Me, Vietnam, to Landing Zone X-Ray in the Ia Drang Valley. On the fourth troop lift, the airlift began to take enemy fire, and by the time the aircraft had refueled and returned for the next troop lift, the enemy had Landing Zone X-Ray targeted. As Major Crandall and the first eight helicopters landed to discharge troops on his fifth troop lift, his unarmed helicopter came under such intense enemy fire that the ground commander ordered the second flight of eight aircraft to abort their mission. As Major Crandall flew back to Plei Me, his base of operations, he determined that the ground commander of the besieged infantry batallion desperately needed more ammunition. Major Crandall then decided to adjust his base of operations to Artillery Firebase Falcon in order to shorten the flight distance to deliver ammunition and evacuate wounded soldiers. While medical evacuation was not his mission, he immediately sought volunteers and with complete disregard for his own personal safety, led the two aircraft to Landing Zone X-Ray. Despite the fact that the landing zone was still under relentless enemy fire, Major Crandall landed and proceeded to supervise the loading of seriously wounded soldiers aboard his aircraft. Major Crandall’s voluntary decision to land under the most extreme fire instilled in the other pilots the will and spirit to continue to land their own aircraft, and in the ground forces the realization that they would be resupplied and that friendly wounded would be promptly evacuated. This greatly enhanced morale and the will to fight at a critical time. After his first medical evacuation, Major Crandall continued to fly into and out of the landing zone throughout the day and into the evening. That day he completed a total of 22 flights, most under intense enemy fire, retiring from the battlefield only after all possible service had been rendered to the Infantry battalion. His actions provided critical resupply of ammunition and evacuation of the wounded. Major Crandall’s daring acts of bravery and courage in the face of an overwhelming and determined enemy are in keeping with the highest traditions of the military service and reflect great credit upon himself, his unit, and the United States Army. Citation: Captain Ed W. Freeman, United States Army, of Boise, Idaho, who distinguished himself by numerous acts of conspicuous gallantry and extraordinary intrepidity on 14 November 1965 while serving with Company A, 229th Assault Helicopter Battalion, 1st Cavalry Division (Airmobile). As a flight leader and second in command of a 16-helicopter lift unit, he supported a heavily engaged American infantry battalion at Landing Zone X-Ray in the Ia Drang Valley, Republic of Vietnam. The unit was almost out of ammunition after taking some of the heaviest casualties of the war, fighting off a relentless attack from a highly motivated, heavily armed enemy force. When the infantry commander closed the helicopter landing zone because of intense direct enemy fire, Captain Freeman risked his life by flying his unarmed helicopter through a gauntlet of enemy fire time after time, delivering critically needed ammunition, water, and medical supplies to the besieged battalion. His flights, by providing the engaged units with supplies of ammunition critical to their survival, directly affected the battle’s outcome. Without them the units would almost surely have gone down, with much greater loss of life. After medical evacuation helicopters refused to fly into the area because of intense enemy fire, Captain Freeman flew 14 separate rescue missions, providing lifesaving evacuation of an estimated 30 seriously wounded soldiers-some of whom would not have survived had he not acted. All flights were made into a small emergency landing zone within 100 to 200 meters of the defensive perimeter, where heavily committed units were perilously holding off the attacking elements. Captain Freeman’s selfless acts of great valor and extraordinary perseverance were far above and beyond the call of duty or mission and set a superb example of leadership and courage for all of his peers. Captain Freeman’s extraordinary heroism and devotion to duty are in keeping with the highest traditions of military service and reflect great credit upon himself, his unit, and the United States Army. Ed Freeman attained the rank of Major before retiring from the Army in 1969. He then flew as a helicopter pilot for the Department of the Interior until 1991. He passed away due to Parkinson’s Disease on August 20, 2008 and was laid to rest in the Idaho State Veterans Cemetery. Bruce Crandall retired from the Army in 1977 as a Lieutenant Colonel. He was promoted to Colonel on the retired list as an added tribute coincidental with his receipt of the Medal of Honor. Colonel Crandall is still living.